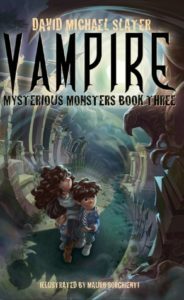 Maddie, Max, and Theo have come to the most haunted neighborhood in the most haunted city in America—and they’re staying in the spooky Vampire House. While their father searches for evidence to prove its blood-sucker is fake, they set out on a search of their own through a city of the dead to a crumbling Voodoo shack. The Mattigan kids are on the case—but sometimes even the cleverest plan can be a recipe for disaster.